This Coffee House has been operated by original owner for over 9 years in an AAA location with many Large National and Local brands in the center in an East Ventura County area. Beautifully furnished and well equipped Franchise Coffee House is a beautiful place to relax and enjoy your favorite coffee drink, delicious tea or blended decadent treat. 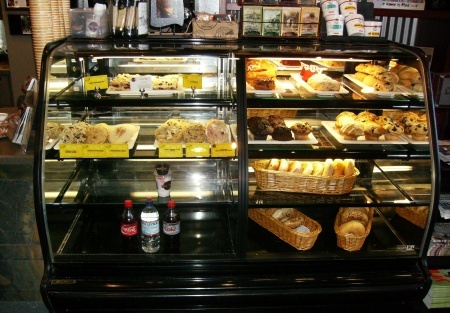 With fresh pastries delivered daily and so many choices its hard to choose only one. With very little marketing done since opening 9 years ago there are many that just are unaware that this jewel is here. With little effort you can reach the many business near by and the 33K+ local residents and remind them you are here to serve them. Owner opened this after retiring with a nice pension coming in monthly and has not NEEDED to actively build this business to support his family. BUT You come in here with a profitable base established there is no telling just what could happen here. Market to just the traffic in this shopping center and see your business grow. This is a MUST SEE!! Owner is relocating out of state. Wants to leave before winter so he has recently reduced the price to a ridiculously LOW PRICE. This is a Great Opportunity for an entrepreneur to own their own established business. PRICED TO SELL QUICKLY!!! With sales starting to rebound up (since Aug. 2011), this selling price could increase in the not to distant future. WOW LOOK AT THESE DEMOGRAPHICS!!!!! The income level! This is a franchise and buyer will need to be approved and receive training from franchisor..
To get further information please go to the red tab on left “Get Name and Address” and come by, taste the quality, see the beautiful decor and see if this is not Just What You Have Been Looking FOR!! 2 Years remain + 5 Year Option + Landlord Will Give 1 More Option.